Product #21263 | SKU 203954 | 0.0 (no ratings yet) Thanks for your rating! 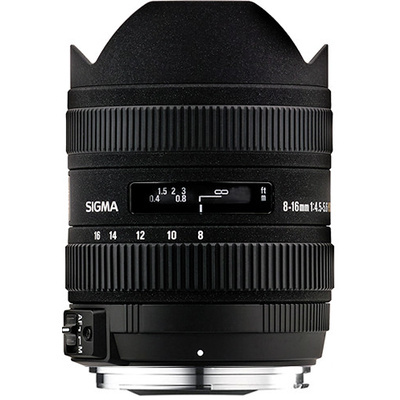 The Sigma 8-16mm F4.5-5.6 DC HSM is an ultra-wide zoom that has a 35mm equivalent angle of view of a 12-24mm lens when used on DSLRs with APS-C size image sensors. Sigma's FLD glass elements, equal to fluorite glass, correct for distortions and colour aberrations to deliver beautiful high contrast images. The lens has a minimum focusing distance of 24cm allowing you to get in close to a subject to create exaggerated perspectives. This super wide angle zoom is perfect for shooting landscape photography, architecture, building interiors, photojournalism, wedding photography, group pictures and a wide variety of other shooting opportunities you may encounter. Note: Due to the curved shape of the front element, filters cannot be attached to this lens. This is a DC series lens designed exclusively for use with Canon EOS DSLRs with APS-C size sensors. The lens features FLD glass elements with performance equal to fluorite glass to compensate for colour aberration. The Super Multi-Layer Coating reduces flare and ghosting while superior peripheral brightness ensures high contrast images throughout the entire zoom range. One hybrid aspherical lens and two glass mould elements give excellent correction for distortion and astigmatism. It produces images with exaggerated perspective with its wide angle view. The HSM (Hyper-Sonic Motor) ensures quiet and high-speed AF as well as full-time manual focus capabilities.